As we’ve seen time and again, most time capsules are incredibly boring. 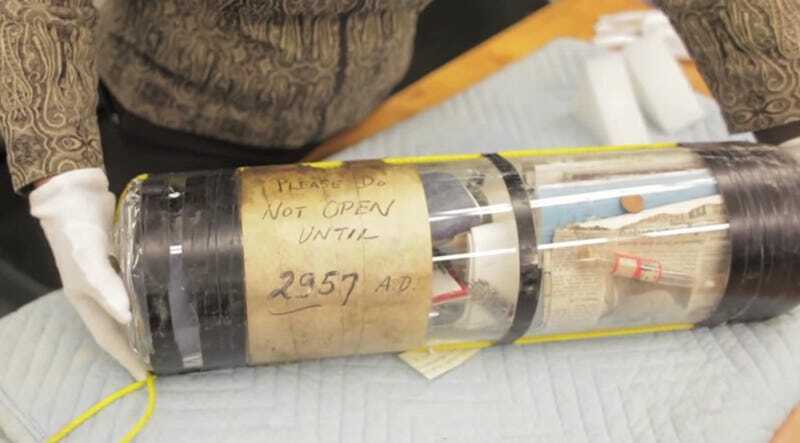 But MIT recently discovered a time capsule filled with some amazing materials from 1957 inside. It’s not supposed to be opened until the year 2957, and thankfully MIT is honoring that wish. The time capsule was buried in 1957 under the direction of MIT President James R. Killian Jr. and a professor of electrical engineering Harold Edgerton, pictured below. And amazingly the glass capsule seems to have weathered its time underground pretty well. People who follow time capsule news are tragically familiar with the two common disappointments in capsule discovery: Boring contents, and capsules turned to mush by the elements. But as MIT News notes, the people who made the capsule knew what they were doing, filling it with argon gas before it was sealed and buried. “Remember that this was just four months prior to the launch of Sputnik and the start of the ‘Space Race’ with the Soviet Union. MIT researchers were focused on developing the technologies of the future and they were excited about the completion of the Compton Laboratories,” Deborah Douglas, director of collections at the MIT Museum told MIT News. As I’ve written before, the burying of a time capsule is an inherently optimistic act. First, there’s optimism in the idea that your time capsule will be found and appreciated in the future. And secondly, there’s some optimism in the belief that there will be any humans around to unearth your time capsule. This 1,000-year time capsule epitomizes both forms of this optimism. We cannot guess what the next millenium holds for the world or whether you will regard our age as one science. But we are confident that you will have a greater understanding of the Universe and that we will have made some contribution to that understanding. We wish you continued success in the pursuit of knowledge. This isn’t MIT’s first time capsule, nor would it be the university’s last. But this time capsule’s journey to the year 2957 has been interrupted ever so slightly. Hopefully it still reaches the people of 2957, however MIT ultimately chooses to deliver this time-traveling tube.